Revised Common Lectionary (RCL) is an integral tool for a majority of mainline Protestant churches in Canada and the United States. It is a three-year cycle of weekly readings (lessons) from throughout the Scriptures. The RCL was first published in 1992, based on earlier works from 1983, 1969, breaking from the pre-Vatican II medieval lectionary. 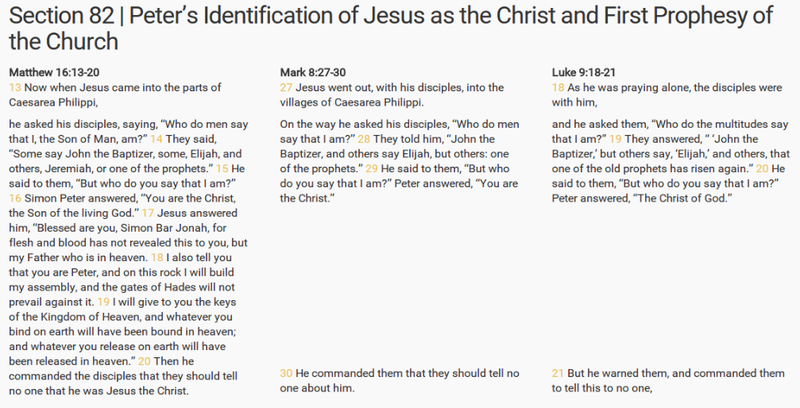 The gospel readings for each year come from one of the synoptic gospels such that in Year A the priest reads from Matthew, Year B from Mark, and Year C from Luke and additional readings from the Gospel according to John in Lent and most of Easter. We think you’ll benefit tremendously by studying “the rest of the story” every year of the Lectionary. We launched The Lectionary Series on the Sixteenth Sunday after Pentecost. Reading from the Harmony of the Gospels you’ll obtain a better understanding of each Gospel reading noting its chronological context, and gain clarity by reading the voice of the other gospelers, as well as their silence noted by blank space and absence. This series is not our primary resource but one of many complimentary series and resources. It is our hope those visiting our site because of the Lectionary Series might themselves feel called to form and lead a Harmony Bible Group helping other study the Word of God, transform their lives and make disciples who make disciples. This table will help you find the corresponding sections for each week of the lectionary. Click here to see the entire archive.